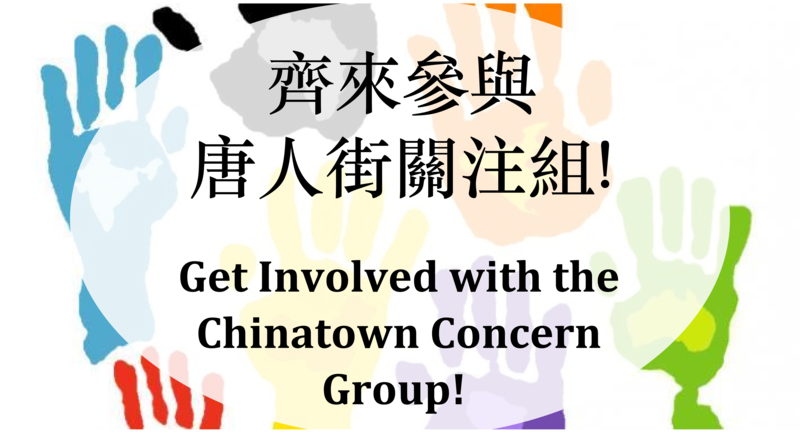 In order for us to build a more equitable and brighter future for Chinatown, we need you to get involved! At this time, this is how you can get involved. Regardless of whether or not you speak English or Chinese, there are ways you can get involved! 一個基礎性的關注組隊；這隊讓我們的組員更好地發揮他們的能力！A central team in Chinatown Concern Group that enables our members to further unleash their power! 筆譯人員 （中英文）– 工作包括：翻譯信、請願書、政府文件及來自爭取社會公義但只說英語的群體的資料等等 Translators (between English and Chinese): Work will include translating letters, petitions, documents from government, and materials from English-speaking groups fighting for social justice etc. 口譯人員 （英語、廣東話、普通話及其他中國鄉下話）– 工作包括：在不同會議、活動、節目、行動及集會幫關注組領袖及組員翻譯 Interpreters (English, Cantonese, Mandarin, Other Chinese Dialects): Work will include interpretating at various meetings, events, actions, and rallies. 關注組組員每兩週會在一個周末的早上開會來討論我們的項目、華埠消息和建立我們對社區事件的分析。Concern Group member leaders meet biweekly on a weekend morning to discuss our projects, Chinatown updates, and to build analysis. 參與研究計劃來支持唐人街關注組的工作。 研究計劃包括：圖資工作、收集資料關於房屋大廈、統計、研究關於世界各地的唐人街、土地用途等等 （這些工作一般需要用英文先能完成）Participate in research projects to support the Chinatown Concern Group’s work. Projects can range from mapping, gathering information about housing projects, statistics, research on other Chinatowns around the world, zoning, etc. (this work generally requires English language skills in order to complete. 想參與關注組但不清楚怎樣能夠參與？ 我們想與你聯係 – 先聯絡我們，然後我們會找配搭你的才能興趣與我們的工作！ Want to get involved but not sure how? We want to connect with you – get in touch with us and we’ll go from there!